While the summer movie season is still in full swing, fans of Vince Flynn's iconic Mitch Rapp novel series will likely be waiting for the summer to end, with the fall release of the highly-anticipated American Assassin. CBS Films has released a new red band trailer, with R-rated language, an all-ages green band trailer and a new poster and character banners for this upcoming action-thriller, hitting theaters September 15 from CBS Films and Lionsgate. This movie could be the start of a big franchise for the studio, with 15 novels based on this character that could also be adapted for the big screen. American Assassin tells the story of legendary CIA agent Mitch Rapp. Long before he began hunting terrorists, Rapp was a gifted college scholar/athlete. Then, tragedy struck and Rapp was recruited into the nation's most elite covert operations program, where he is trained by a legendary soldier named Stan Hurley (Michael Keaton). After completing training designed to teach the kind of lethal skills necessary to target our most dangerous enemies, here and abroad, he is a man reborn with a mission of retribution. The trailer from CBS Films teases more about this character's origins, who has become a literary icon over the past two decades. CBS Films first bought the rights to the Vince Flynn novel series back in 2008, nine years after the first book Transfer of Power was published in 1999. After releasing nine more successful novels which all continued the Mitch Rapp story line, the author took fans back to the beginning by publishing American Assassin in 2010, which showed how Mitch Rapp was recruited into the CIA, with the subsequent 2012 novel Kill Shot bridging the gap between American Assassin and the author's first novel, Transfer of Power, with a second 2012 novel, The Last Man, continuing the story in present day. Vince Flynn passed away in 2013 after a three-year battle with prostate cancer, with author Kyle Mills taking over the Mitch Rapp novel series. This adaptation almost had a much different cast, when it was first being developed at CBS Films. The studio reportedly offered star Chris Hemsworth $10 million to play Mitch Rapp, but he turned down the role after scheduling issues arose. The studio also wanted Bruce Willis to play Stan Hurley at one point, with Jeffrey Nachmanoff at one point set to direct, with Edward Zwick and Marshall Herskowitz adapting the script. The project finally got back on the right track with director Michael Cuesta (Kill the Messenger) working from a script by Stephen Schiff (Wall Street: Money Never Sleeps). Sanaa Lathan also stars as Irene Kennedy, the CIA officer who recruits Mitch Rapp into these elite program, with Taylor Kitch portraying Stan Hurley's former predecessor, a covert operative now only known as Ghost, who has the same set of deadly skills that Hurley has taught Mitch. Shiva Negar also stars as a Turkish covert agent, who teams up with Mitch and Irene to stop Ghost, who is planning on pulling off a deadly terrorist attack in the Middle East. CBS Films has set a September 15 release date for American Assassin, putting it up against Open Road Films' thriller All I See Is You. 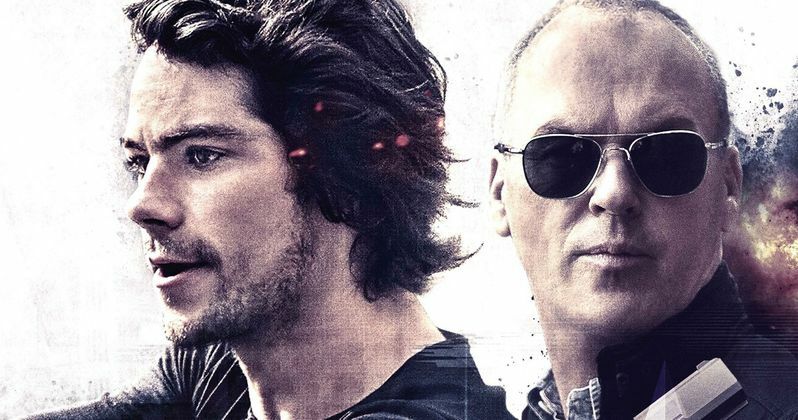 Take a look at both the red band and green band versions of the new American Assassin trailer, along with the latest poster and character banners. Can American Assassin End IT's Reign of Terror at the Box Office?